Made for Chefs by Chefs. Knorr Beef Stock-base is made with quality beef fat from Australia, blended with spices to give you that full-bodied meaty flavour and beef aroma. With a delicious meaty flavour, you can also use Knorr Beef Stock-base to replace bones and meat as desired, especially in beef-based stocks, soupy dishes, sauces and stews. 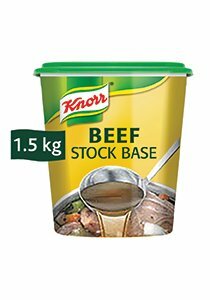 • Can use Knorr Beef Stock Base to replace bones and meat as desired, especially in beef-based stocks, soupy dishes, sauces and stews.